The first space Meyer conceived of became the Bar Alfred, named for the legendary MoMA director Alfred Barr, who in this scenario was Enright’s closest friend. Enraged by his friend’s forced resignation (a real life occurrence in 1943), “Enright quickly called upon interior designer George Stacey (Meyer had just finished reading Maureen Footer’s excellent monograph) and artist Arshile Gorky, one of Barr’s favorites, to create (Bar Alfred) “the best” bar/club in the city … in honor of his friend.” So clever! Like all the diminutive diorama’s Meyer created for the project, the Bar Alfred, above, has amazing proportion and perspective based on his intoxicating narrative, where truth and fiction seamlessly meld. The red rooms and entry supposedly inspired frequent visitor and Stacey client Diana Vreeland to ask, “Georgie when the hell am I getting a red room?” We all know where that led! But it was the truly impressive and imaginative details that blew me away. 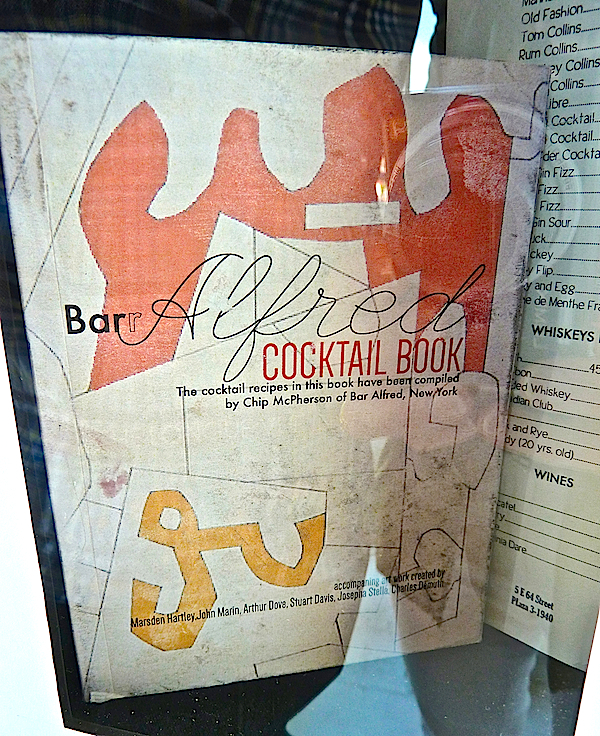 The Bar Alfred logo above feels perfect for the period, including references to the Gorky-esque style and I’m sure the cocktail book, below, would have been considered the chicest hostess gift of the day with artwork by Marsden Hartley, John Marin, Arthur Dove, Stuart Davis, Joseph Stella and Charles Demuth. 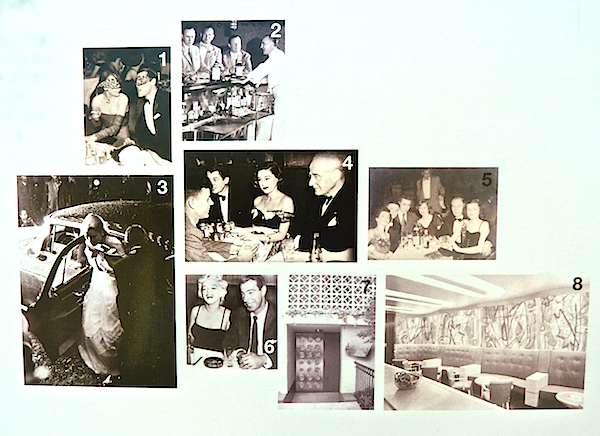 Who wouldn’t have wanted to hang out in a place where Franz Kline, Willem de Kooning, Lee Krasner and Robert Motherwell were all regulars, the first Thursday each month was masquerade night (photo 1), and visitors included Grace Kelly (3), Mr & Mrs. Alfred Vanderlbil and JFK (4) and Marilyn Monroe and Joe DiMaggio (6). The Bar Alfred private entrance, in image 7, is actually an Edward Durrell Stone townhouse in NYC. Meyer changed the door to a more stylish one by Jean Prouvé and added the bar logo to the right. The Gorky Mural Bar (8) is actually a Morris Lapidus private space in which Meyer created and photoshopped in the artist’s fictitious work. And the couple on the right in party photo 5 is actually Meyer’s parents. In thinking of the apartment building’s occupants, Meyer considered that Enright grew up in Pennsylvania. That’s when the aristocratic Julia Henry came to mind. It worked chronologically that Enright could have met husband, lawyer Charlton Henry, in Philadelphia in 1914. They of course hit it off and Henry introduced Enright around to all the biggest movers and shakers in finance. Within no time, Enright had made his first million. When Henry died in 1936, Enright returned the favor by giving his friend’s wife, Julia, nee Biddle, the 22nd floor duplex, in which her daughter lived until 1952. Immortalized in Diane Arbus’ iconic images, Mrs. T. Charlton Henry was known for her formidable bouffant, love of fashion and fitness and an indomitable zest for life. 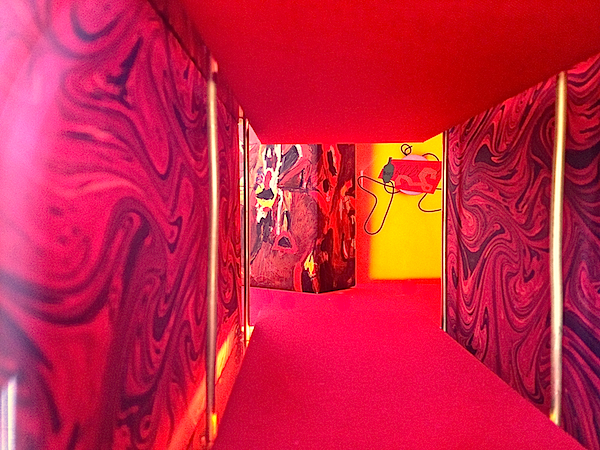 shows his vision for the space with lacquered double doors leading to a 23′ tall room. “Walls were reverse painted sheets of glass. 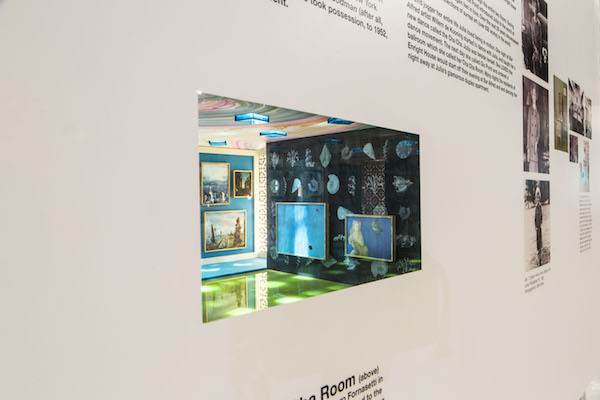 The seashell imagery was painted at the Fornasetti Studio in Milan. 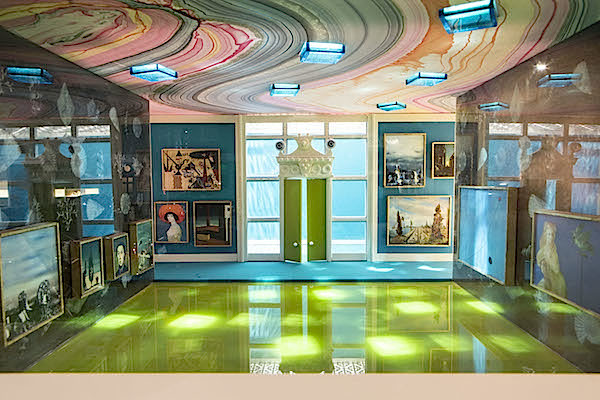 The swirling marble ceiling was painted by Gio Ponti’s assistants. Ponti designed the blue ceiling lights that were hand blown in Italy by Murano (effectively emulated with lit tops from acrylic Container Store boxes). The pediment and door surround was designed by Max Ernst. The floors are poured colored resin. 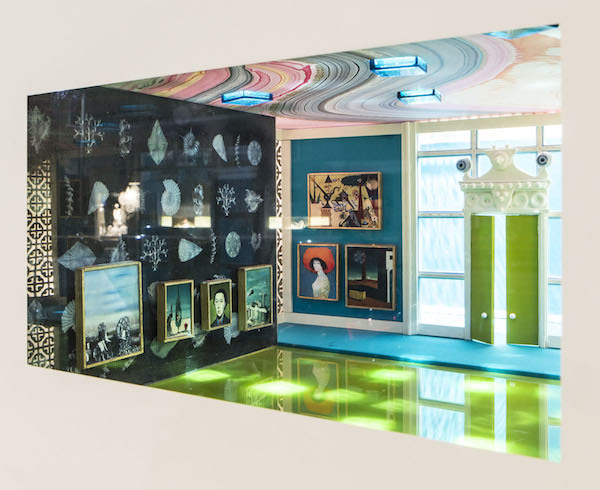 Artworks by: Max Ernst, Joan Miro, Salvador Dali, Giorgio de Chirico, Yves Tanguy and Leonor Fini.” So chic! At 5,900 square feet, Apartment 26 was one of Enright House’s smallest units. 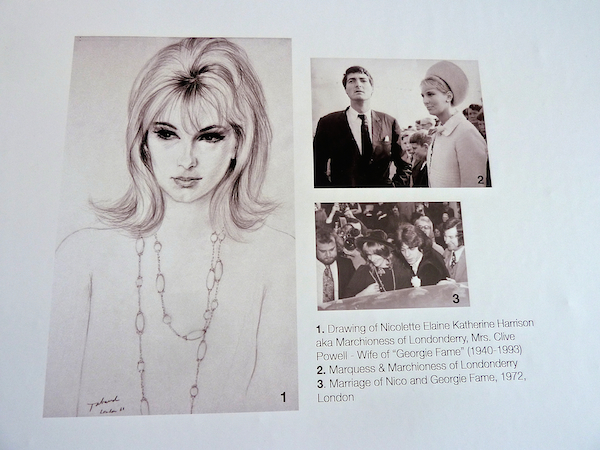 Purchased from original owners Lord and Lady Astor in 1965 by the glamorous and swinging Marquess & Marchioness of Londonderry, the apartment would be decorated by the couple’s British decorator David Hicks, who was simultaneously working on the Hicks Suite at the St. Regis. 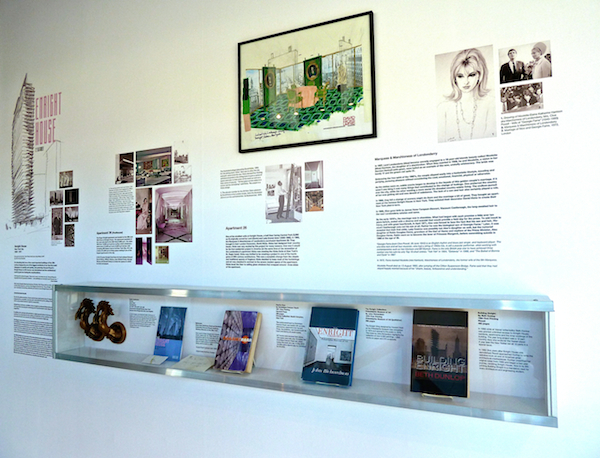 Meyer imagined this apartment as an homage to Hicks, whose Nico house in Hampstead (Lady Londonderry’s nickname was Nico) is one of Meyer’s favorites. 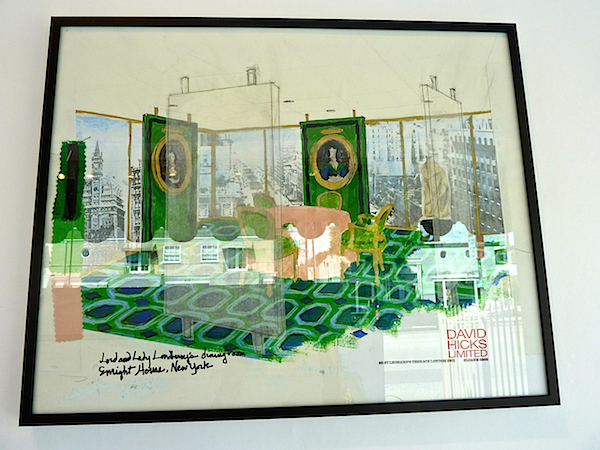 Hicks’ design for the apartment, above, (cleverly executed by Meyer of course) shows the dining room, with four floating upholstered panels to” give a sense of space and color, as well a false sense of security” to a room with floor to ceiling glass on two sides. The curtains part behind the panels so that when open, you would never see them. The juxtaposition of old and new is vintage Hicks. Those of you old enough to remember or well versed in London scandal will recall that the couple’s son and heir Viscount Castlereagh turned out to actually be the biological son of Georgie Fame (aka Clive Powell), the musician. And their first daughter, Lady Cosima claimed that her actual father was Robin Douglas-Home, future lover of Princess Margaret. Although the Marquess later married Fame with whom she remained for twenty year, Apartment 26 was beset by tragedy as both Douglas-Home and the Marquess later committed suicide. Back to the public spaces, Roark’s original entry was redesigned by Frances Elkins in 1933, above. As shown in another of Meyer’s diorama’s, the 22′ ceiling was canvas painted offsite in silver black and white. As Enright’s collection grew, the new lobby became a rotating repository of art. 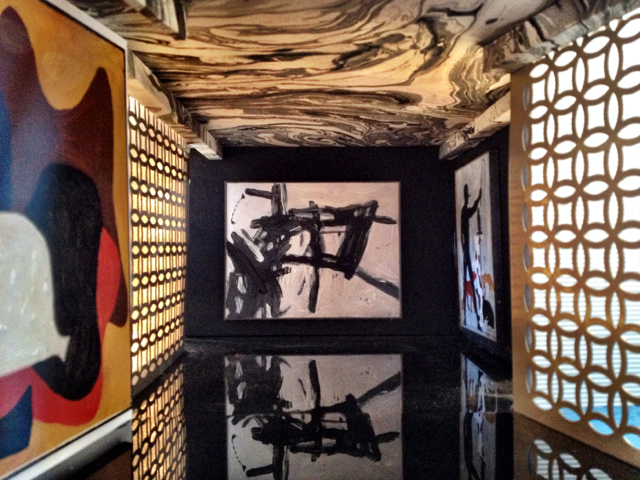 A huge Gorky mural on the left, Francis Picabia’s Animal Trainer on the right and one of the largest Franz Klein’s ever painted hung above, reflected in the polished black granite floors. All executed by Meyer, it’s like a mini 20th century art and design lesson. Located off the main lobby the lesson continued with Enright’s private gallery, designed, in Roark’s absence (on a project in Brazil) by Donald Deskey, the designer of Radio City Music Hall. For this space, Meyer placed hand made copies of work by Jean Arp, Reg Butler, Pablo Picasso, Walt Kuhn, Kees van Dongen, Joan Miro, Franz Kline and Willem de Kooning. In addition to the actual rooms of Enright House, Meyer continued to create a mythical reality surrounding the structure. 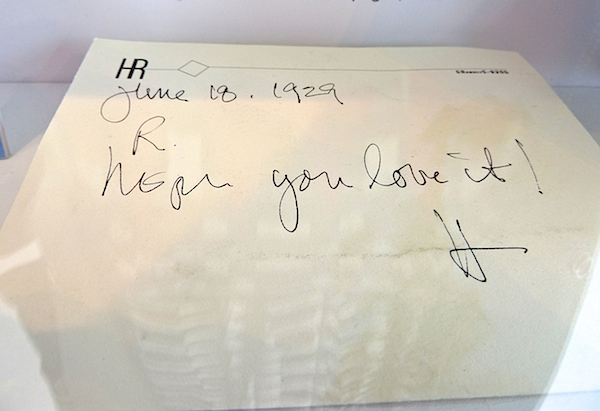 In Meyer’s world, ephemera such as a note card, business card and brochure found their way to the collection of the Whitney. The level of detail is amazing – check out the coffee stain and paper clip embossing on Roark’s business card from the 1920’s. And of course the phone number had the Gramercy prefix. 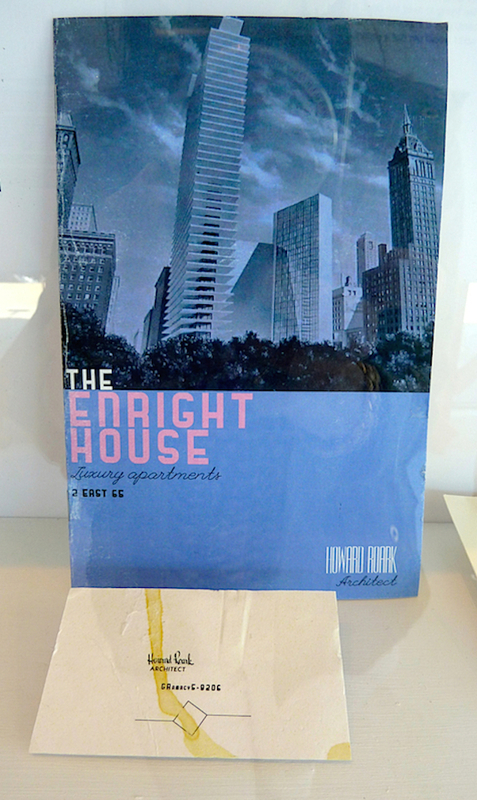 The three fictional monographs on Roark and Enright include authentically executed book jackets. I told Doug I would have definitely hired him in the days when I commissioned such work. 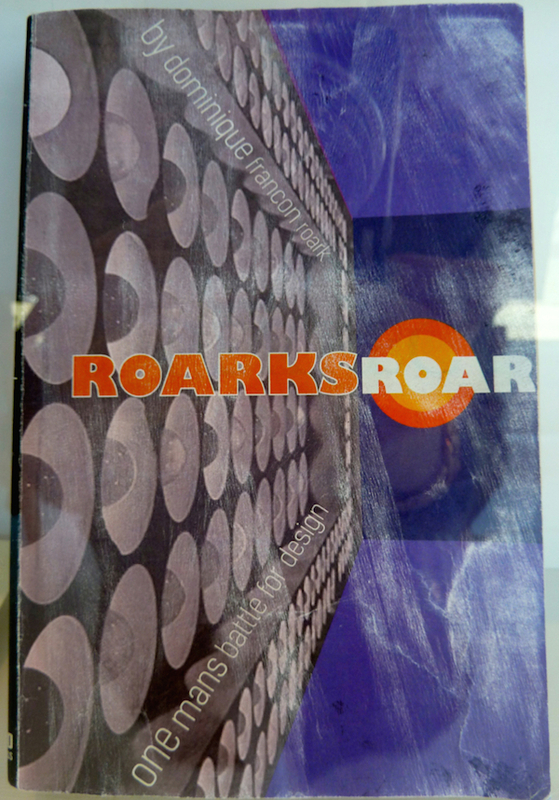 Roark’s Roar was the “controversial book by Dominique Francon Roark, loaded with so many defamatory statements that Harvard Press, the publisher, was forced to pull the book and destroy all unsold copies. … 1st Dibs sold a signed copy by Dominique for $12,000.” Gotta love it! 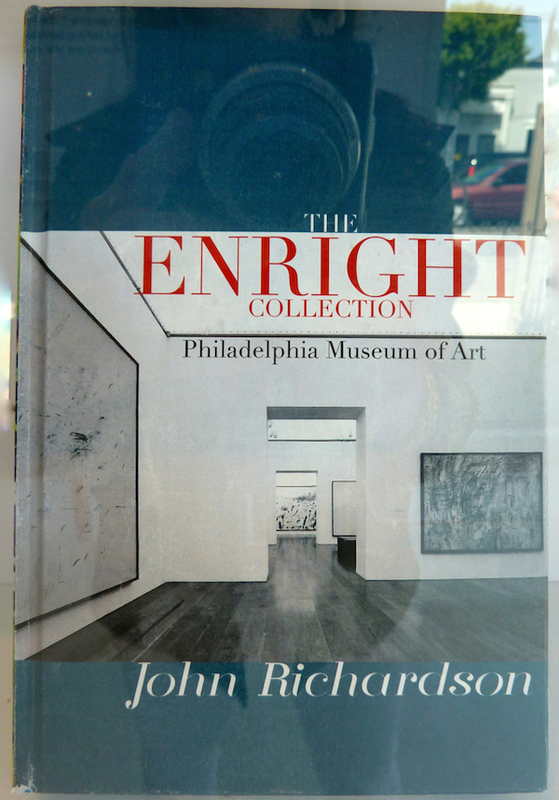 The Enright Collection by none other than (real life) distinguished art historian and author John Richardson features the collection at the Philadelphia Museum of Art. The back story on this insider twist is that Alfred Barr was succeeded at the Modern by Rene d’Harnoncourt, whose daughter Anne d’Haroncourt became the director of the Philadelphia Museum of Art. So Meyer cleverly hypothesized that Enright, to spite the Modern for Barr’s dismissal, worked with Roark designing a eponymous wing for the Philadelphia Museum, to whom he left his massive collection. 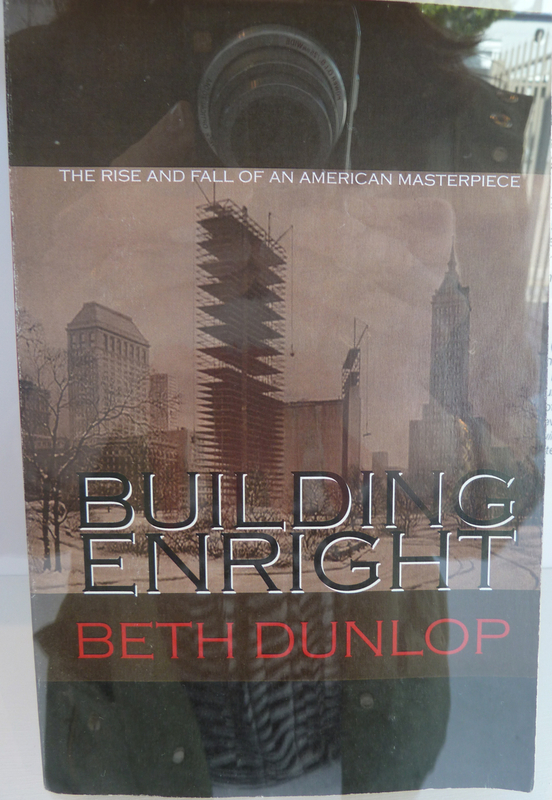 And the last book, Building Enright is authored by Beth Dunlop, in real life, the editor-in-chief of MODERN Magazine. While at Vassar (which she indeed did attend) she supposedly wrote a 12 part story on Enright House which eventually ran in the New Yorker. She was then approached to write the definite guide to Roark’s masterpiece, now in its 5th printing. Congratulations Beth – too bad you can’t earn royalties! 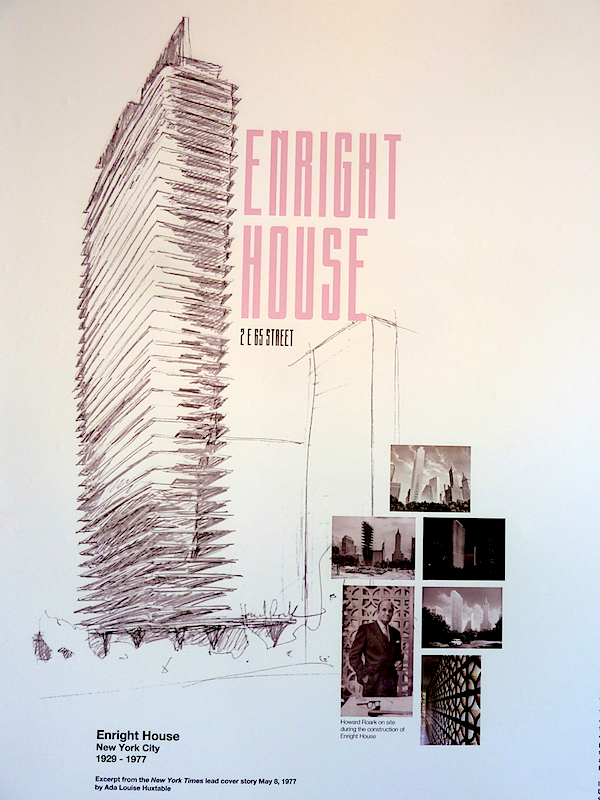 The ending to the fictional saga was Enright House’s destruction in 1977 due to structural issues, although with the sale of the land and insurance, all 29 tenants benefitted financially. Even legendary architectural critic Ada Louise Huxtable spent three years trying to save the structure. This tour de force of fictional reality was a dazzling display of creative artistry. With historical accuracy and clever choices, it walked the fine line between fact and fiction. But as Doug agreed, it’s all about story telling, especially in the movie capital of the world, where the best story, conveyed in the most convincing authentic way, is a prized commodity. This entry posted in architecture, art, art history, books, design, furniture, history, interior design, travel. 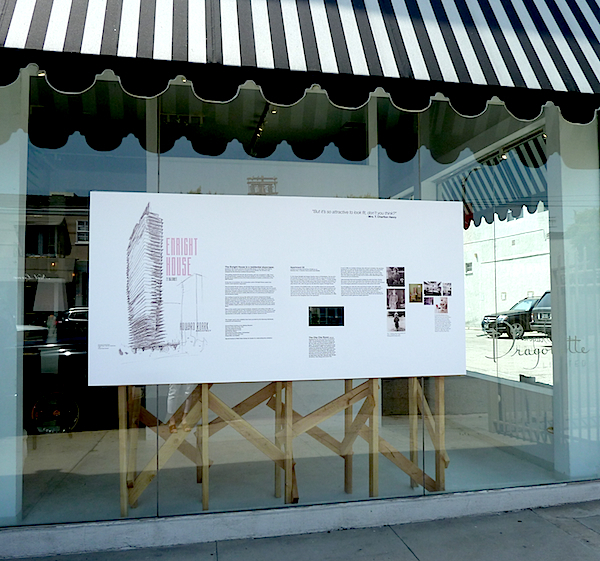 Entry Tags: Doug Meyer, Dragonette, interior design, La Cienega Design Quarter, Legends 2014, The Fountainhead Bookmark the permalink. Fantastic Post. I’m saving this for later reference. I hope that the exhibit is still up at Dragonette as I will be next door today and will drop in. Amazing! I’m once again speechless by my talented brother Doug! 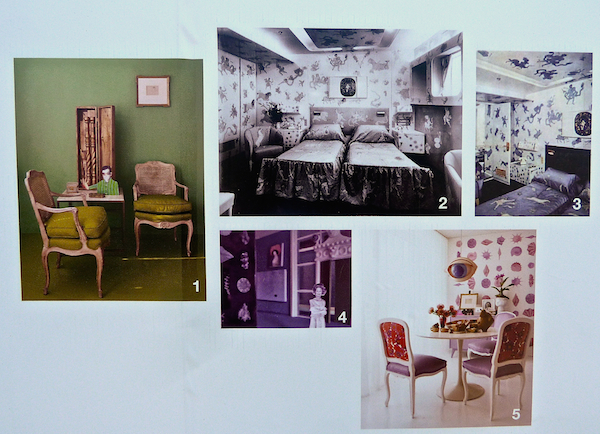 Isn’t it just so wonderful to work in a field where an individual can be given a theme such as Novel Interiors: Storytelling by Design and create this? Doug Meyer, unbelievable execution, it is all there down to book jacket design for books which might have been! Amazing. Brilliant. Loved the post. Want to drop in at Bar Alfred! Superb logo et all! 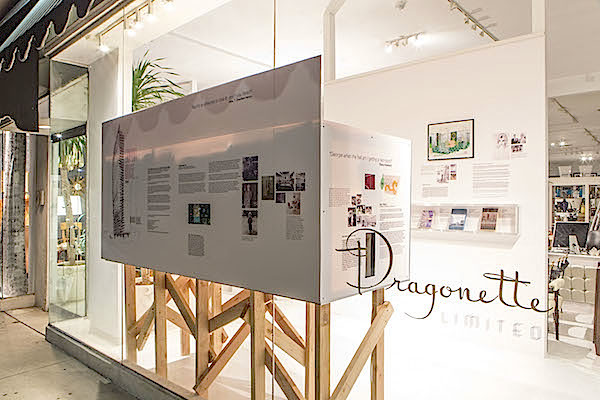 Thank you so much for your excellent coverage of Doug Meyer’s window for Legends here at Dragonette Ltd. We are so very proud of what Doug was able to create! Knowing the window comes down tomorrow I am thrilled to know that it will live on thanks to your attention. As always a pleasure getting to know you better this last Legends! Please stay in touch and stop by whenever you are in town. Stacey I am absolutely blown away by this article. The art, artists, and design aesthetic is so stunning! As the real-life editor of the real MODERN Magazine and the not-real-life author of the fictional/pretend book, Building Enright, I can only say that I’m prouder than proud to have been part of this amazing project. My part was small — I introduced Doug Meyer and Patrick Dragonette as the editor charged with matching designer and galleriest–and then I stepped back to watch the magic unfold! I must say that Doug is just about the most creative person I know (like his brother Gene, I remain in awe of his talents), and Patrick is among the most charming. We at MODERN Magazine are so happy to count them both as our friends! Hi Stacey, this is really fascinating! Thank you so much for all the background information. I saw this window and it was one of my favorites. I enjoyed the windows so much and have told many people about them. What a great event! I wasn’t able to attend Legends but have been transported there via your post. I have been a Doug Meyer fan ever since my early days at House & Garden. What an extraordinary talent. Thank you Quintessence. I ‘ll follow you anywhere!! Doug Meyer moves effortlessly between the worlds of high art, design and performance while wielding a hammer and drill with true precision. His creativity is boundless and his keen intellect is demonstrated here in the many layers of the Enright House. We at the Palos Verdes Art Center are tremendously proud to sponsor his installation for Legends 2014. Well, here I am again! Just had to tell you, in catching up with your posts, that I’m so glad I didn’t miss this one. Truly brilliant stuff! I hadn’t heard of gene Meyer. 78 queries in 0.684 seconds.